I’ve been very lucky to have been involved with Writing West Midlands over recent years. They are a fine bunch of human beings who live to promote literature in the West Midlands region. I was approached by them to see if I’d mind being included in their new brochure, this would include being photographed by a professional photographer. Of course I didn’t mind. You can just spot me on the left amongst the grime of the old library. 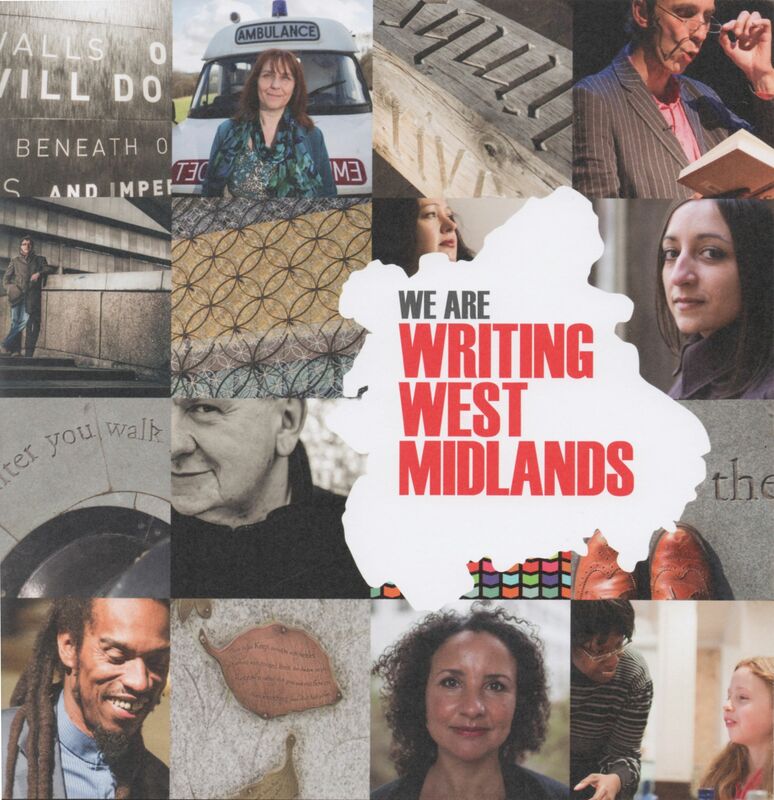 Inside the brochure there a wonderful overview of all the incredible work that the Writing West Midlands team does across the region and across all the possible formats that writing can take. There’s a great map of the region, beautifully put together by Kerry Leslie, that pinpoints some of the outstanding talent that has come from the area. This includes J.R.R. Tolkien, who used to live just down the road from me, Benjamin Zephaniah, Jonathan Coe, Carol Ann Duffy, John Osborne and of course William Shakespeare. 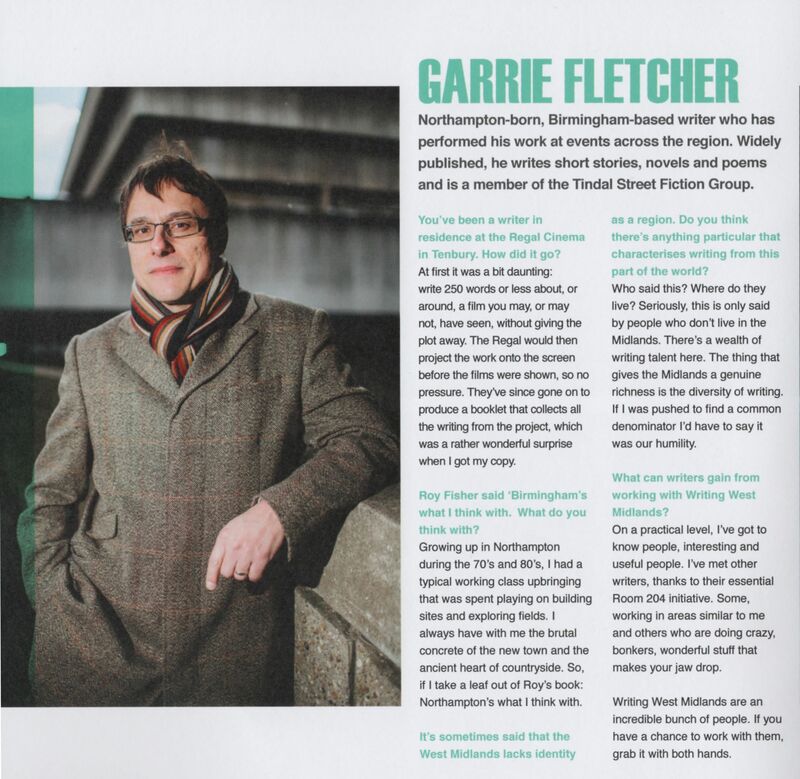 Information on the Birmingham Literature Festival, Write On! Young Writers, The New Library of Birmingham and tons more. The brochure is beautifully put together with great photography, a cool layout and printed on pleasingly thick paper. Inside there is a section on local writers that WWM work with and there are brief interviews with: William Gallagher, Deborah Alma, Cindy George, Fiona Joseph, Rochi Rampal, Helen Cross and me. My page can be read below. Just click on the picture and it’ll open at a readable size. Scary man in cool coat. This summer (2013) I was commission by the West Midlands Readers Network to write a short story for a library book group. It turned out that the book group in Coleshill Library were not interested but that the writers group that was also based there was. I went over in late July and met the group. They were a friendly bunch who made me very welcome. I talked a little bit about the type of things I write and they told me about the stories that they were interested in; it was quite a range. We had crime stories, historical fiction, satire, science fiction, comedy and so on. I made lots of notes. It would be impossible, in the time I had and the amount of words available (2000,) to write something that covered everything they wanted. As it was I wrote two stories, both set in Coleshill. I couldn’t decide which was the story for them, which was the story that would best please them and cover some of what they asked for. In the end I asked Roz. Roz Goddard is a fine poet, short story writer and she runs the West Midlands Readers Network; her advice was bang on. She said use the best one. I knew which was the best story I was just worried it wasn’t right for the group. I visited the Coleshill Writers Group last Monday and read them the story. They liked it and had some excellent questions for me afterwards. If you’re near Coleshill and are interested in writing you should get down there. If you’d also like to hear my story entitled Night Swimming, then come join me and a whole host of others at the New Birmingham Library on Monday the 2nd of December, it’ll be great.